My blender died recently. I would pour liquid in the bowl and that same liquid would rapidly be all over my counter. At first, it was a slow leak. But, more recently it just flowed out. Sigh. I liked that blender. It was the husband who finally told me to get a new blender. And, when he did I told him about the blender I really wanted. I didn’t want just any old blender. No, I had visions of a Vitamix . Oh, how cool, it heats stuff enough to make soup without having to put it in a saucepan. Oh, it pretty much juices stuff? Yep, that’s what I wanted. So, as an early birthday present, I got a Vitamix. And, I’m in love. The smoothies and juices I’ve made have been awesome! The smoothest nicest loveliest purees I’ve ever had. 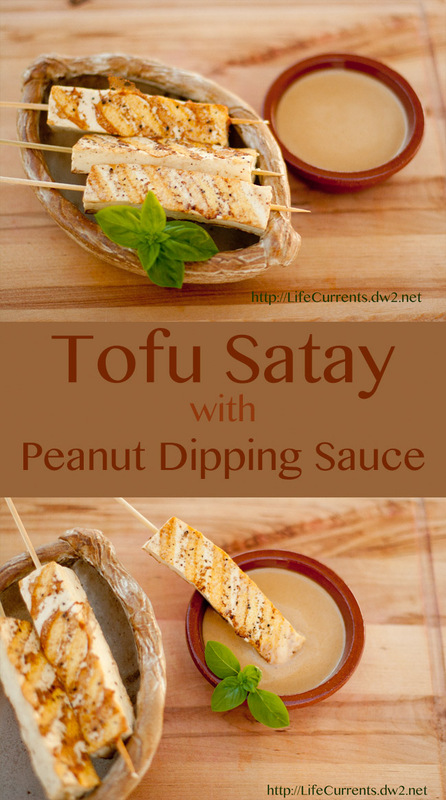 That brings me to today’s post for Tofu Satay with Peanut Sauce. I made the peanut sauce in the Vitamix using whole peanuts. Whole peanuts, I tell you!!! The mixer makes a quick and smooth puree out of them. Amazing! If you have a Vitamix and want to do use it, place all your sauce ingredients in the container and secure the lid. Select Variable 1. Turn the machine on, and increase the speed to Variable 10, then to high. Blend for 1 minute until smooth and heated through. You’ll get an amazing smooth sauce. If you don’t have a Vitamix, no big deal, you can do the sauce in a regular blender but use peanut butter. The sauce will be a little saltier than if you use whole unsalted peanuts. Most people will like that extra saltiness. (BTW, if you’re like me and don’t really care for all the salt, I’ve found that MaraNatha peanut butter is way less salty than any other brand I’ve tried). And, you’ll probably want to heat the sauce to serve it, though I think it’s great cold too. This peanut sauce could be used over pasta or rice as well as the Tofu Satay. Be careful not to slice the tofu too thin if you’re going to skewer it because the skewers will break through and make a tear so the tofu won’t stay on the skewer. If you do tear the tofu, don’t worry, just don’t serve it on the skewer; no biggie! I love this cabbage slaw. I’ve been making it a lot lately. Originally it came from a taco recipe from Just the Food. But, it’s so easy and tasty that I’ve been doing all kinds of things with it. Switch out the sesame oil for a nut oil. Switch out the red cabbage for green. Add some cilantro. Add some mung bean sprouts. It’s great in tacos because the tortilla helps keep it under control when you eat it; it’s a bit messy. But, what’s a little messy eating among friends, right? Don’t worry about the long recipe, it comes together quickly. And, most of the time involved is just waiting for the tofu to marinate. While you wait for that, you can continue on with the remainder of the steps. The final cooking part only takes a few minutes. While I was taking the pictures of the Satay, some Canadian Geese flew by. Pretty birds that we don’t get to see all the time around here. One thing I thought I’d mention is that these nutrition data are general guides. There are lots of factors that go into these nutrition facts. Let’s look a little at this recipe for Tofu Satay, if you use peanut butter in the sauce, amounts of calories and sodium can vary greatly. I have two peanut butters in my house. One, from O Organics, has 200 calories per 2 Tbsp, with 120mg of sodium. Whereas the MaraNatha (I said that was my current favorite!) has 180 calories for the same serving size, with 65mg of sodium. The rest of the stats are pretty much the same for carbs, protein, fiber, etc. That’s almost half as much sodium and 20 calories less per serving! So, as you can see, It’s those little differences that can add up in nutrition data, and that’s why I would call them guides rather than gospel. Makes about 8-12 skewers. Serve as appetizers or serve as dinner over rice. I prefer tofu that isn’t packed in water; it’s easier to use, and I find that it tastes better. But, if all you can find is the water packed variety that will work nicely. If your tofu isn't water packed, continue on with the recipe. Thread 1 tofu piece lengthwise onto the wooden skewer. For the marinade: Whisk all marinade ingredients in a 13x9-inch pan. Place tofu skewers in marinade and spoon marinade over the top of the tofu. Let stand for 1-2 hours at room temperature, or cover and refrigerate up to 1 day. For the sauce: While your tofu is marinating, make the sauce. Blend all sauce ingredients in blender until smooth. Taste adding salt and pepper if desired. Sauce may be heated in a small saucepan over medium-low heat or in the microwave if desired. For the Cabbage Slaw: Toss together all slaw ingredients together in a large bowl to coat, and refrigerate until ready to use. For Satay: Heat a large non-stick skillet or grill pan over medium-high heat. Add oil to pan, and heat until the oil begins to shimmer. Place the tofu skewers in the pan and pour a little of the marinade over the top. Cook until tofu releases from the pan and is golden brown, about 4 minutes. Flip tofu skewer over and pour a little more of the marinade over the top. Cook about 4 minutes again checking for golden brown. Serve tofu satay skewers over cabbage slaw with Peanut Sauce for dipping. *To toast sesame seeds, place a heavy dry skillet over medium-high heat. Add sesame seeds, and cook about 3-5 minutes, shaking the pan occasionally. They are ready once they darken and become fragrant. I know what you mean, I’ve had a big beautiful shiny stand mixer (Kitchen Aid type thing) for many years now. I’ve only used it once. Dan’s used it more than me at 3 times I think. I think that I just don’t like being that far from my food as I make it. I mean, I like to stick my fingers in it and mix it with a fork so I can see what’s going on. But, the stand mixer is just too impersonal for me. So, there is sits on the shelf going unused. Sounds delicious! But do you really put paper towels right next to your tofu?? Don’t they fall apart and stick to the tofu? I just wrap mine in a clean cloth towel, maybe two, when I want to get the water out. I’ve never had a problem with the paper towels sticking and falling apart (and I’ve used that method a lot). But, you make a good point, if the paper towels are thin, maybe just stick to the clean cloth towel. And, there’s less to throw away if you use the cloth towel, which is always a plus! Oh, and I never buy paper towels with printing on them, only plain white ones so there’s no worries about the dyes transferring to my food. I have been thinking about getting a vitamin, my food processor is dying. These looks great! This looks tasty. Thanks for sharing your recipe with the hearth and Soul Hop. I’ve pinned it to my vegetarian Pinterest board. Absolutely love the variety of colors in this dish. My mouth is watering just looking at your photos! I received a Vitamix for my birthday this year, too 🙂 Have yet to test it out with peanuts so I’ll have to make this sauce 🙂 Looks delish!